This entry was posted in SweetSheep, vending, yarnaholic and tagged community, fiber, handmade, handmade soap, rhodeisland, yarn by shoelaceswitcher. Bookmark the permalink. Thanks for saying hi! 🙂 I love finding blogs of people nearby! Oh, that is too bad! There are people who are of the mindset that the pie is only so big, and they deal with competition much differently that those (like you, apparently) who think that the pie can grow and we can al support each other, even if we make similar products. Too bad the music was so loud you could not have a conversation, and explain WHY you were taking a card. Anyways, I wanted to say that while I do understand the frustration with competition, it makes more sense to have multiple vendors so that everyone can try new things and get what fits them best. Sorry to hear that not all people feel the same. Sounds like a very unpleasant encounter. I guess that not everyone is as embracing of our supportive crafty culture as we are. As with all walks of life, we occasionally encounter someone who is rude and negative. So glad that you were able to enjoy the rest of the event though, it sounds like a great place to vend. whoa, what an unpleasant experience! Yikes. I think that there are always going to be people out there that run their lives governed by fear- fear that someone else selling a similar product will take away their customers, fear that someone might take their ‘ideas’, fear that their product isn’t as good compared to another’s, etc. For me, when I meet people like that, it reminds me how toxic fear is- and that I need to shake it off anytime I feel it creeping into my life. Because I don’t want to end up like that lady! Wow, that really stinks. I’m sorry you had such an unpleasant experience. She should be more confident in herself and her products. And it’s not like she invented soap-making, I’m sure she has a few tricks that came from someone else. We all do. I’m glad you had a nice time otherwise! What a shame, I am a firm believer that we all support each other. In a different world you may have referred someone who wanted her type of soap to her, and vice versa. I guess the best we can do is try to take this as a lesson and try never to behave in the same, hurtful way. Even if you HAD been doing it in a malicious way (would you have done it so openly?) there is a right and wrong way to deal with things which means you don’t inadvertently cause pain to someone else! I’m so sorry for you. Wow, that’s too bad….I did buy soap from a vendor on Sunday….it smelled so yummy and we always buy handmade soap…we haven’t used a “store” bought one in close to ten years….but if she’s that sensitive, imagine if she was a dyer and selling at the many events…there is lots of competition..and sometimes it is hard for individuals to stand out…..I’m sorry she had a bad experience….and I’m sorry it soured the event for you…but glad Sunday ended up better and so glad I stopped by to say hello…. I think she overreacted myself, competition in general is a good thing, it encourages diversity and it also means that if someone has allergies they’re more likely to find something they can use if there’s different base options. Fear and insecurity are some of the biggest dangers I think. I have seen that sort of fear of competition, and it is so unnecessary and hurtful and destructive. I can certainly understand how you felt. The market chooses its favourites, and one vendor cannot hope to increase their share of it by attempting to chase off all perceived competition. Don’t let her get you down. Your products look so yummy – I wish I was close enough to make shipping worthwhile! 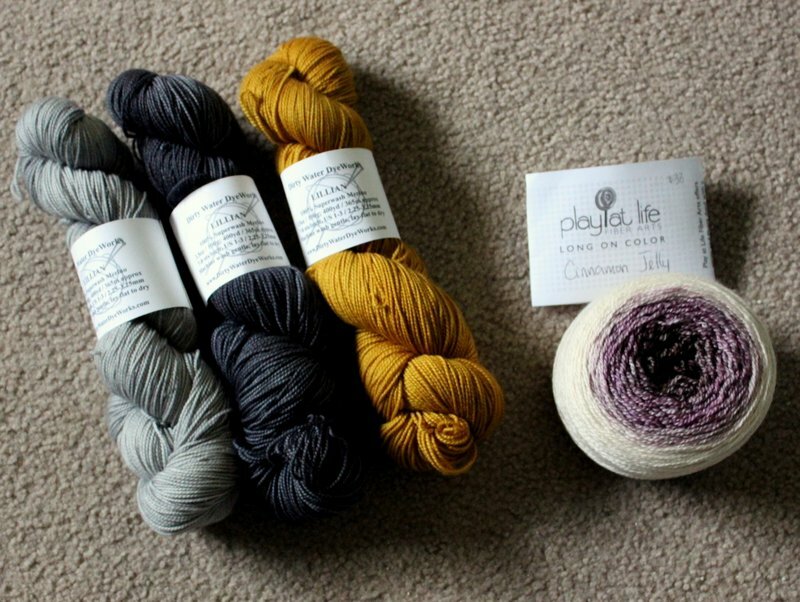 That yarn you got looks delightful – I see a striped shawl all over that yarn you chose… Do you have plans for it!? What a shame that happened to you. I hope it hasn’t put you off from doing it again, and it sounds like there are lots of good things to remember about the weekend. That sounds very distressing, particularly because your intentions were so misunderstood. That is worst part really, the thought that someone you don’t know assumed your actions were malicious. Breathe deeply, your sweater looks fabulous and you know you are a good person. That’s so sad! Has she seriously never had another vendor buy her stuff before? Some people just have a skewed perception of life and worry too much about losing what they think they have. If the things you create are unique, you shouldn’t have to worry about someone stealing your customers, just saying.. Sorry you had that experience! I feel like most people in this community are super kind and supportive! I’m sad for the both of you. Her for having to experience the horror of having her ideas stolen. (Been there. It takes a good long time for the bitterness to subside.) And for you, who had pure intentions, but walked into a mind field. It’s a tough area to navigate. I think you’ve done well. What an unfortunate experience, but it sounds like you rose above her hostility. Creative competition can be a positive motivating force. It’s too bad that you encountered the negative side to it.